Jenny Kane - jkane@shawmedia.com Fred Etheridge, 95, and his wife Fay Etheridge, 97, celebrate their 75th wedding anniversary. The couple has three children and have lived in Crystal Lake for over 60 years. Fred said he saw Fay get off the school bus and thought she was too good for him, but after working for a movie theatre when he was in high school he caught her eye. 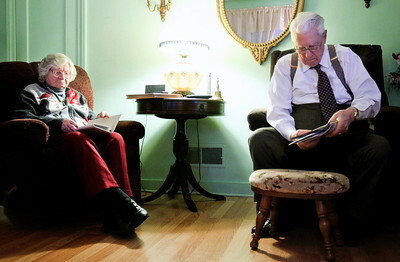 Jenny Kane - jkane@shawmedia.com Fred Etheridge, 95, puts away mail while his wife Fay Etheridge, 97, looks at family photographs during a family get together for their 75th wedding anniversary. The couple has three children and have lived in Crystal Lake for over 60 years. Jenny Kane - jkane@shawmedia.com Photographs of Fred Etheridge, 95, and his wife Fay Etheridge, 97, lay on their kitchen table during a family celebration of their 75th wedding anniversary. The couple has three children and have lived in Crystal Lake for over 60 years. 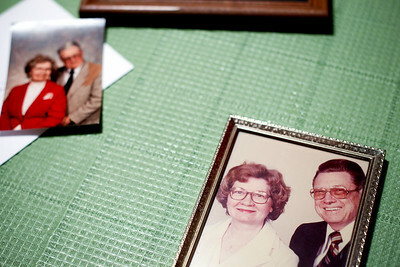 Photographs of Fred Etheridge, 95, and his wife Fay Etheridge, 97, lay on their kitchen table during a family celebration of their 75th wedding anniversary. 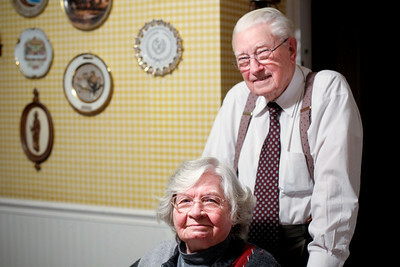 The couple has three children and have lived in Crystal Lake for over 60 years.